Motor neurons are nerve cells located in the brain, brainstem, and spinal cord that serve as controlling units and vital communication links between the nervous system and the voluntary muscles of the body. Messages from motor neurons in the brain (called upper motor neurons) are transmitted to motor neurons in the spinal cord (called lower motor neurons) and from them to particular muscles. In ALS, both the upper motor neurons and the lower motor neurons degenerate or die, ceasing to send messages to muscles. Unable to function, the muscles gradually weaken, waste away (atrophy), and twitch (fasciculations) . Eventually, the ability of the brain to start and control voluntary movement is lost. Lou Gehrig's Disease causes weakness with a wide range of disabilities (see section titled "ALS Symptoms"). Eventually, all muscles under voluntary control are affected, and patients lose their strength and the ability to move their arms, legs, and body. When muscles in the diaphragm and chest wall fail, patients lose the ability to breathe without ventilatory support. Most people with ALS die from respiratory failure, usually within 3 to 5 years from the onset of ALS symptoms. However, about 10 percent of ALS patients survive for 10 or more years. Because ALS affects only motor neurons, the disease does not impair a person's mind, personality, intelligence, or memory. Nor does it affect a person's ability to see, smell, taste, hear, or recognize touch. Patients usually maintain control of eye muscles and bladder and bowel functions. The cause of ALS is not known, and scientists do not yet know why ALS strikes some people and not others. An important step toward answering that question came in 1993 when scientists supported by the National Institute of Neurological Disorders and Stroke (NINDS) discovered that mutations in the gene that produces the SOD1 enzyme were associated with some cases of familial ALS. This enzyme is a powerful antioxidant that protects the body from damage caused by free radicals. Free radicals are highly unstable molecules produced by cells during normal metabolism. If not neutralized, free radicals can accumulate and cause random damage to the DNA and proteins within cells. Although it is not yet clear how the SOD1 gene mutation leads to motor neuron degeneration, researchers have theorized that an accumulation of free radicals may result from the faulty functioning of this gene. In support of this, animal studies have shown that motor neuron degeneration and deficits in motor function accompany the presence of the SOD1 mutation. Studies also have focused on the role of glutamate in motor neuron degeneration. 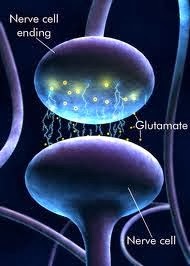 Glutamate is one of the chemical messengers or neurotransmitters in the brain. Scientists have found that, compared to healthy people, ALS patients have higher levels of glutamate in the serum and spinal fluid. Laboratory studies have demonstrated that neurons begin to die off when they are exposed over long periods to excessive amounts of glutamate. Now, scientists are trying to understand what mechanisms lead to a buildup of unneeded glutamate in the spinal fluid and how this imbalance could contribute to the development of ALS. Autoimmune responses which occur when the body's immune system attacks normal cells—have been suggested as one possible cause for motor neuron degeneration in ALS. Some scientists theorize that antibodies may directly or indirectly impair the function of motor neurons, interfering with the transmission of signals between the brain and muscles. In searching for the cause of ALS, researchers have also studied environmental factors such as exposure to toxic or infectious agents. Other research has examined the possible role of dietary deficiency or trauma. However, as of yet, there is insufficient evidence to implicate these factors as causes of Lou Gehrig's Disease. The onset of Lou Gehrig's disease may be so subtle that the symptoms are frequently overlooked. The earliest symptoms of ALS may include twitching, cramping, or stiffness of muscles; muscle weakness affecting an arm or a leg; slurred and nasal speech; or difficulty chewing or swallowing. These general complaints then develop into more obvious weakness or atrophy that may cause a physician to suspect ALS. The parts of the body affected by early symptoms of ALS depend on which muscles in the body are damaged first. In some cases, ALS symptoms initially affect one of the legs, and patients experience awkwardness when walking or running or they notice that they are tripping or stumbling more often. Some patients first see the effects of the disease on a hand or arm as they experience difficulty with simple tasks requiring manual dexterity such as buttoning a shirt, writing, or turning a key in a lock. Other patients notice speech problems. Regardless of the part of the body first affected by the disease, muscle weakness and atrophy spread to other parts of the body as the disease progresses. Patients have increasing problems with moving, swallowing (dysphagia), and speaking or forming words (dysarthria). Symptoms of upper motor neuron involvement include tight and stiff muscles (spasticity) and exaggerated reflexes (hyperreflexia) including an overactive gag reflex. An abnormal reflex commonly called Babinski's sign (the large toe extends upward as the sole of the foot is stimulated in a certain way) also indicates upper motor neuron damage. Symptoms of lower motor neuron degeneration include muscle weakness and atrophy, muscle cramps, and fleeting twitches of muscles that can be seen under the skin (fasciculations). 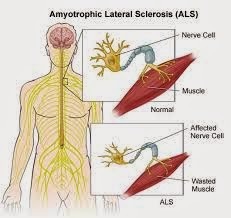 To be diagnosed with amyotrophic lateral sclerosis, patients must have signs and symptoms of both upper and lower motor neuron damage that cannot be attributed to other causes. Although the sequence of emerging ALS symptoms and the rate of disease progression vary from person to person, eventually patients will not be able to stand or walk, get in or out of bed on their own, or use their hands and arms. Difficulty swallowing and chewing impair the patient's ability to eat normally and increase the risk of choking. Maintaining weight will then become a problem. Because the disease usually does not affect cognitive abilities, patients are aware of their progressive loss of function and may become anxious and depressed. Health care professionals need to explain the course of the disease and describe available treatment options so that patients can make informed decisions in advance. In later stages of the disease, patients have difficulty breathing as the muscles of the respiratory system weaken. Patients eventually lose the ability to breathe on their own and must depend on ventilatory support for survival. Patients also face an increased risk of pneumonia during later stages of Lou Gehrig's Disease. No one test can provide a definitive diagnosis of ALS, although the presence of upper and lower motor neuron signs in a single limb is strongly suggestive. Instead, the diagnosis of Lou Gehrig's disease is primarily based on the symptoms and signs the physician observes in the patient and a series of tests to rule out other diseases. Physicians obtain the patient's full medical history and usually conduct a neurologic examination at regular intervals to assess whether symptoms such as muscle weakness, atrophy of muscles, hyperreflexia, and spasticity are getting progressively worse. Because ALS symptoms can be similar to those of a wide variety of other, more treatable diseases or disorders, appropriate tests must be conducted to exclude the possibility of other conditions. One of these tests is electromyography (EMG), a special recording technique that detects electrical activity in muscles. Certain EMG findings can support the diagnosis of ALS. Another common test measures nerve conduction velocity (NCV). Specific abnormalities in the NCV results may suggest, for example, that the patient has a form of peripheral neuropathy (damage to peripheral nerves) or myopathy (muscle disease) rather than amyotrophic lateral sclerosis. The physician may order magnetic resonance imaging (MRI), a noninvasive procedure that uses a magnetic field and radio waves to take detailed images of the brain and spinal cord. Although these MRI scans are often normal in patients with ALS, they can reveal evidence of other problems that may be causing the symptoms, such as a spinal cord tumor, a herniated disk in the neck, syringomyelia, or cervical spondylosis. Infectious diseases such as human immunodeficiency virus (HIV), human T-cell leukemia virus (HTLV), and Lyme disease can in some cases cause ALS-like symptoms. Neurological disorders such as multiple sclerosis, post-polio syndrome, multifocal motor neuropathy, and spinal muscular atrophy also can mimic certain facets of the disease and should be considered by physicians attempting to make a diagnosis. Because of the prognosis carried by this diagnosis and the variety of diseases or disorders that can resemble Lou Gehrig's disease in the early stages of the disease, patients may wish to obtain a second neurological opinion. No cure has yet been found for ALS. However, the Food and Drug Administration (FDA) has approved the first drug treatment for the disease—riluzole (Rilutek). Riluzole is believed to reduce damage to motor neurons by decreasing the release of glutamate. Clinical trials with ALS patients showed that riluzole prolongs survival by several months, mainly in those with difficulty swallowing. The drug also extends the time before a patient needs ventilation support. Riluzole does not reverse the damage already done to motor neurons, and patients taking the drug must be monitored for liver damage and other possible side effects. However, this first disease-specific therapy offers hope that the progression of ALS may one day be slowed by new medications or combinations of drugs. 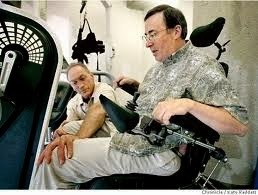 Physical therapy and special equipment can enhance patients' independence and safety throughout the course of ALS. Gentle, low-impact aerobic exercise such as walking, swimming, and stationary bicycling can strengthen unaffected muscles, improve cardiovascular health, and help patients fight fatigue and depression. Range of motion and stretching exercises can help prevent painful spasticity and shortening (contracture) of muscles. Physical therapists can recommend exercises that provide these benefits without overworking muscles. Occupational therapists can suggest devices such as ramps, braces, walkers, and wheelchairs that help patients conserve energy and remain mobile. ALS patients who have difficulty speaking may benefit from working with a speech therapist. These health professionals can teach patients adaptive strategies such as techniques to help them speak louder and more clearly. As ALS progresses, speech therapists can help patients develop ways for responding to yes-or-no questions with their eyes or by other nonverbal means and can recommend aids such as speech synthesizers and computer-based communication systems. These methods and devices help patients communicate when they can no longer speak or produce vocal sounds. Patients and caregivers can learn from speech therapists and nutritionists how to plan and prepare numerous small meals throughout the day that provide enough calories, fiber, and fluid and how to avoid foods that are difficult to swallow. Patients may begin using suction devices to remove excess fluids or saliva and prevent choking. When patients can no longer get enough nourishment from eating, doctors may advise inserting a feeding tube into the stomach. The use of a feeding tube also reduces the risk of choking and pneumonia that can result from inhaling liquids into the lungs. The tube is not painful and does not prevent patients from eating food orally if they wish. When the muscles that assist in breathing weaken, use of nocturnal ventilatory assistance (intermittent positive pressure ventilation [IPPV] or bilevel positive airway pressure [BIPAP]) may be used to aid breathing during sleep. Such devices artificially inflate the patient's lungs from various external sources that are applied directly to the face or body. When muscles are no longer able to maintain oxygen and carbon dioxide levels, these devices may be used full-time. Patients may eventually consider forms of mechanical ventilation (respirators) in which a machine inflates and deflates the lungs. To be effective, this may require a tube that passes from the nose or mouth to the windpipe (trachea) and for long-term use, an operation such as a tracheostomy, in which a plastic breathing tube is inserted directly in the patient's windpipe through an opening in the neck. Patients and their families should consider several factors when deciding whether and when to use one of these options. Ventilation devices differ in their effect on the patient's quality of life and in cost. Although ventilation support can ease problems with breathing and prolong survival, it does not affect the progression of ALS. Patients need to be fully informed about these considerations and the long-term effects of life without movement before they make decisions about ventilation support. Social workers and home care and hospice nurses help patients, families, and caregivers with the medical, emotional, and financial challenges of coping with ALS, particularly during the final stages of the disease. Social workers provide support such as assistance in obtaining financial aid, arranging durable power of attorney, preparing a living will, and finding support groups for patients and caregivers. Home care nurses are available not only to provide medical care but also to teach caregivers about tasks such as maintaining respirators, giving tube feedings, and moving patients to avoid painful skin problems and contractures. Home hospice nurses work in consultation with physicians to ensure proper medication, pain control, and other care affecting the quality of life of patients who wish to remain at home. The home hospice team can also counsel patients and caregivers about end-of-life issues.